a place near and dear to my heart. Being that this blog’s central theme is food from the perspective of a (former) restaurant and (former) hotel chef, I would like comment on why we, as chefs, love Thanksgiving so much. Bare in mind, Thanksgiving means, for many of us, the beginning of our busy seasons. Thanksgiving kicks the season off with a bang, and it doesn’t end until the New Year, and if you work in Los Angeles, it doesn’t end until award season is through. Thanksgiving means lots of long nights and early mornings, lots of extra planning and work, and lots of added aggravation, that quite frankly, we don’t need in our lives. Burn out syndrome begins. So why do we care so much? Why do we (chefs) love Thanksgiving. We love it because we know how much it means to everyone else. We feel privileged that you would spend your family Thanksgiving with us, at our restaurant, eating the food and menu that we put together. We live a life of servitude. We are here to serve you, and if you’re happy, we do well. Our job is to make you happy, and spending Thanksgiving with us makes us even happier. In the end, the hours don’t mean a thing. We clean up, pass around a bottle of red wine, wish each other a happy holiday, and go home happy. The life of a chef is a different sort of life. We work when you do not, we put ourselves through hell to take care of you. And when you’re happy, so are we. You may, from time to time, ask why restaurant turkey (at high end places of course) taste better. It’s a valid question. Is it the free range, organic, never frozen, grass fed Sonoma birds we use? Yes… Is it due to a lengthy brining, seasoning and roasting process? Yes… But restaurants and hotels also do what average people would never dare to do: We break down our turkeys well ahead of time. Never will a hotel chef roast whole turkeys (unless it’s for a single show piece). To better understand the cooking process is to better understand the turkey itself. 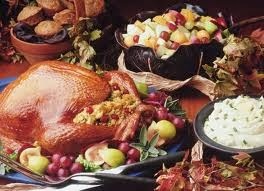 Like any other bird, a whole turkey is a combination of white (breast) meat, dark (leg) meat and bones (carcass). We all know that white and dark meats cook at different rates, and white meat will dry out and overcook long before the dark meat. To combat this, we truss the bird, brine the bird, and try to take lots of temperature readings so we don’t over cook the bird. But, how many times have you shown up a friend or relative’s for Thanksgiving, only to be served beautiful but bone-dry turkey? Restaurant style turkey. Break down the turkey ahead of time. Make the bones into a turkey stock which in turn becomes your gravy. Brine the breasts and then slather them with a garlic/sage compound butter before roasting. Confit the legs, which is a simple process of curing them before cooking them. You won’t have a ‘showpiece’ turkey, but you’ll have the absolute best tasting turkey you’re ever made. This is how I do mine for the holidays. It may seem like a bit of work, but in the end, on game day, it will save you an enormous amount of work, and clean up. If you’ve trusted me this far, take another step and give this a try. Break the turkey down into a classic French four piece (https://www.youtube.com/watch?v=5–amriFgsQ Except don’t cut the legs in half!). Place the bones, 2 of the onions, the celery, carrots, 1/2 the thyme, 1/2 the peppercorns and 1 bay leaf in a large stock pot. Add enough cold water to barely cover and bring to a simmer. Skim the foam that rises to the top. Cook for 4 hours and strain through a fine mesh strainer. Return the stock to a smaller pot and reduce by half. Cool quickly and reserve. In a small pot, heat 1/4 gallon of water with 1 cup salt and 1 cup sugar. Add a few sprigs of the remaining thyme, the remaining peppercorns and the remaining onion. When the sugar and salt are dissolved, pour the solution into a large container and add about 3/4 gallon of cold water. Place the turkey breasts in the solution, cover tightly and let sit in a refrigerator over night. In a mixing bowl, combine the remaining sugar, salt, and remaining thyme. Place the turkey legs in cure and make sure to cover evenly. Transfer the legs to a non-reactive container, pour the remaining cure over the top and cover tightly. Refrigerate over night. In a mixer fitted with a paddle attachment, add the butter, sage and garlic. Mix until well combined. Season lightly with salt and pepper. Reserve. First step is to finish the confit. Remove the legs from the cure and rinse thoroughly to wash off all the sugar and salt. Pat dry. 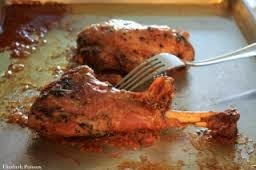 In a saute pan, sear the turkey legs in a little oil until golden brown on all sides. Transfer the legs to a small pot, cover with the turkey stock and simmer until incredibly tender, but not falling apart. Remove the legs from the stock and pick the meat off. Second step is prepping and roasting the breasts. Heat an oven to 400 degrees.Remove the breasts from the brine and pat dry. Tie the breasts with butcher’s twine, making sure to pull the skin tight over the meat. Rub the breasts in oil, season the whole things with ground pepper and paprika, and slather the top of the skin with the compound butter. Roast on a roasting rack in the oven until the skin is crispy and the internal temperature is 150. Remove and let rest in a warm place for about 10 minutes. Gravy. While the turkey breasts are roasting, use the turkey stock you cooked the legs in for your gravy. I suggest mixing 1 additional stick of butter with about 3/4 cup flour until a paste forms and whisking this into your simmering stock and seasoning with salt and pepper, but you can use any gravy recipe you like. Before serving. Place the breasts back in the over along with the picked confit meat for about 3 minutes just to re-heat. You can also heat the confit meat in warm gravy. Remove the butcher’s twine and slice the turkey thin. Serve with the confit meat and slathered in gravy. This entry was tagged Roast, Thanksgiving, Turkey. Bookmark the permalink.